Mr. Andres Manuel Lopez Obrador, known locally as AMLO, was elected as new Mexican president on a platform promising austerity and thus he selected yesterday to sit out the 4-hour delay on a commercial flight rather than to opt using the presidential plane. His flight from the southern state of Oaxaca to Mexico City was delayed because of heavy rain and some on social media posted pictures of the president-elect patiently waiting till he could depart. 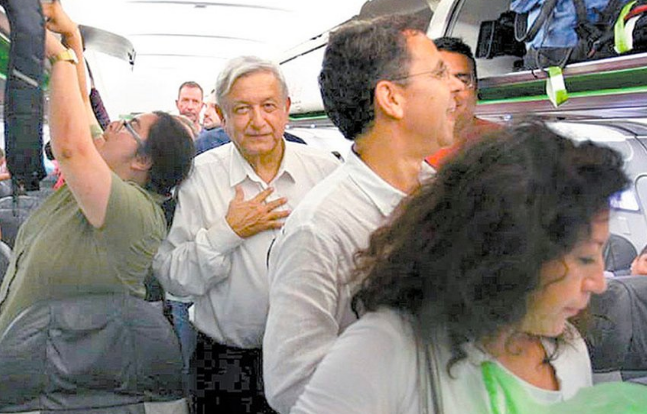 Commenting from his aircraft seat, Mr. Obrador said: "I won't get on the presidential plane." His comments came as Mr. Obrador, together with other passengers spent nearly three hours on the grounded plane until they were asked to go back to the terminal, where they waited another hour before the flight was finally able to leave. The left-wing leader won the presidential election earlier this year by a landslide and has vowed to rein in corruption and put an end to outrageous spending. Related coverage: <a href="https://thegoldwater.com/news/31507-Mexico-New-President-Instantly-Slashes-Own-Salary-60"> Mexico - New President Instantly Slashes Own Salary 60%</a>. Mexico has a presidential jet, a Boeing 787 Dreamliner which cost the country some $218.7m (it was delivered two years ago after former President Felipe Calderón ordered it back in 2012). Mr. Obrador has vowed it will be sold, stating it was ludicrous in this day and age and that "not even Donald Trump has one like it." The president-elect explained to other passengers that he would be "embarrassed" to board "a luxurious plane in a country where there is so much poverty". "I'm not going to change my mind because of this. Enough with this tomfoolery, it's over, it's over, any politician who acts arrogantly won't last." However, some residents of the capital of Mexico City were less understanding. Another chimed in as well. Mr. Arturo Miranda: "We would have to ask ourselves how would he travel when he has to attend an international event?" Mexico’s President-elect Mr. López Obrador also promised to turn the presidential palace into a cultural center, live in a more modest home and cut his own presidential salary. Trump needs to learn a lesson from this guy. ALMO, the Mexican Bernie Sanders. Oh yes, he also said he had gone broke after spending most of his company's money during the elections and will not be able to make all of his promises. I will not be surprised when taxes will rise up to pay for his programs. A Mexican Bernie Sanders would ask for donations, keep the plane, then become a cartel dictator.